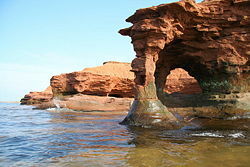 Prince Edward Island is a Canadian province consisting of an island of the same name. Nestled in the Gulf of Saint Lawrence, this maritime province is the smallest in the nation in both land area and population (excluding the territories). The population is around 140,000 residents, collectively referred to as "Islanders." While Prince Edward Island did not join Canada until six years after its founding, it became known as the "Birthplace of Confederation" for having hosted the Charlottetown Conference. This Conference was the first meeting in the process leading to the Articles of Confederation and the creation of Dominion of Canada in 1867, and was held in PEI's capital and largest city, Charlottetown. The Island's northern beaches attract birdwatchers and windsurfers, while its southern beaches are acclaimed as the warmest waters north of the Carolinas. With its beautiful natural environment and quaint towns, Prince Edward Island is a seemingly idyllic setting. However, in 2006, abnormally high rates of diagnosed rare cancers on the Island were brought to light. Health officials, ecologists and environmental activists point to the use of pesticides for industrial potato farming as a primary contaminant. What was found on Prince Edward Island was contamination via "second-hand" pesticide exposure. 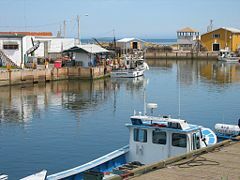 Known as the "Garden of the Gulf," Prince Edward Island is located in the Gulf of Saint Lawrence west of Cape Breton Island, north of the Nova Scotia peninsula, and east of New Brunswick. Its southern shore bounds the Northumberland Strait. The island has two urban areas. The largest surrounds Charlottetown Harbour, situated centrally on the island's southern shore, and consists of the capital city Charlottetown, and suburban towns Cornwall and Stratford and a developing urban fringe. A much smaller urban area surrounds Summerside Harbour, situated on the southern shore 40 km (25 mi) west of Charlottetown Harbour, and consists primarily of the city of Summerside. As with all natural harbors on the island, Charlottetown and Summerside harbors are created by rias (drowned river valleys). 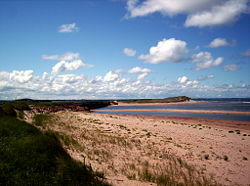 The island's landscape is pastoral: rolling hills, woods, reddish white sand beaches, ocean coves and the famous red soil have given Prince Edward Island a reputation as a province of outstanding natural beauty. The provincial government has enacted laws that attempt to preserve the landscape through regulation, although the lack of consistent enforcement and absence of province-wide zoning and land-use planning has resulted in some aesthetically displeasing development in recent years. The island's lush landscape has had a strong bearing on both its economy and its culture. Author Lucy Maud Montgomery drew inspiration from the land during the late Victorian Era for the setting of her classic novel, Anne of Green Gables. Today, many of the same qualities that Montgomery and others found in the island are enjoyed by tourists who visit during all seasons. The economy of most rural communities on the island are based on small-scale agriculture, with relatively small farms. There is an increasing amount of industrial farming as older farm properties are consolidated and modernized. The coastline consists of a combination of long beaches, dunes, red sandstone cliffs, salt water marshes and numerous bays and harbors. The beaches, dunes, and sandstone cliffs consist of sedimentary rock and other material with a high iron concentration which oxidises upon exposure to the air. The geological properties of a white silica sand found at Basin Head are unique in the province; the sand grains cause a scrubbing noise as they rub against each other when walked on, aptly named the singing sands. Large dune fields on the north shore can be found on barrier islands at the entrances to various bays and harbors. The sand dunes at Greenwich are of particular significance; the shifting, parabolic dune system is home to a variety of birds and rare plants and has also proven to be of interest to archaeologists. A wood boardwalk in Prince Edward Island National Park. Rolling hills characterize a significant portion of the island's landscape. Prince Edward Island National Park is situated along the island's north shore, fronting the Gulf of St. Lawrence, and covers 8.5 square miles (22 sq km). Established in 1937, the park's mandate includes the protection of many broad sand beaches, sand dunes and both freshwater wetlands and saltmarshes. The park's protected beaches provide nesting habitat for the endangered Piping Plover; the park has been designated a Canadian Important Bird Area. An extension was added to the park in 1998 when an extensive sand dune system in Greenwich was transferred from the provincial government to Parks Canada. 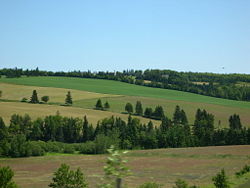 The National Park also includes Green Gables, which was the childhood inspiration for the Anne of Green Gables novels by author Lucy Maud Montgomery. 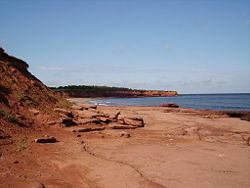 In recent years, environmental and conservation groups have identified Prince Edward Island National Park as being the most endangered in the national park system, based on human impact. The park also experiences severe coastal erosion as a result of winter storms and its vulnerable shoreline. Prince Edward Island's climate varies widely. The winter weather begins in November, with flurries as early as late October. 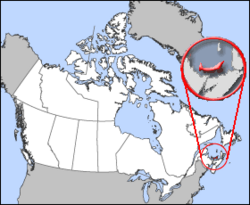 Through November and December, the temperatures are typically from 5°C (41°F) to -5°C (-41°F), though these can vary greatly if the province experiences a late fall or early winter. As the Northumberland Strait and the Gulf of St. Lawrence freeze they contribute to the colder temperatures and heavier snowfall than seen in Nova Scotia and New Brunswick. The temperature steadily falls until the beginning of February, when a two week period of -30°C (-22°F) is experienced, following which the temperatures steadily rise. From as early as December until as late as April, the island is handicapped by severe storms and blizzards. While Canada's mainland warms in the spring, the surrounding ice keeps the island cold and snowy for a few more weeks. Once this ice has melted, the temperatures rise continuously until spring begins, in early-mid May. The spring weather patterns are very erratic, at any time in May the temperatures can reach 25°C (77°F) or sink as low as 0°C-5°C (32°F-23°F). Most of the precipitation experienced in May is a continuous drizzle as opposed to rainfall, though there are exceptions. The weather stabilizes around mid-June, at about 15°-20° (59°F-68°F). The summer is mild and humid in July, but there is drier weather in August, as well as higher temperatures, to 30°C (86°F). The long winter and late spring are compensated for by the summer continuing through September and even into October. The autumn is very short, only 3 or 4 weeks, and is when the temperatures drop quickly. In 2006, studies were conducted by researchers at Environment Canada who became concerned about the abnormally high rates of diagnosed rare cancers on the Island. Health officials, ecologists and environmental activists point to the use of pesticides for industrial potato farming as a primary contaminant. High pesticide levels were found in those tested in comparison to other people in Canada, which were attributed to "second-hand" pesticide exposures, a phenomenon similar to second-hand cigarette smoke. One of the studies conducted showed a likelihood that the entire population of the Island in summer is exposed to airborne pesticides. Prior to the European colonization of North America, Prince Edward Island was used by the Mi'kmaq people from the mainland who used the island seasonally for fishing, hunting, and planting. They called the island Abegweit, meaning Land Cradled on the Waves. They believed that the island was formed by the Great Spirit by placing dark red clay which was shaped as a crescent on the Blue Waters. The island's discovery is credited to Jacques Cartier, the French navigator, in June 1534. However, there are those who believe that John Cabot saw the island in 1497. The island was claimed for France in 1603, by Samuel de Champlain, the first governor of French Canada who called it "Île Saint-Jean." Three hundred French settlers colonized Prince Edward Island in 1720, settling at the harbor of Charlottetown and establishing Port la Joie. Acadian fishermen and trappers also came to the island in the 1700s, establishing several small scattered communities. The island's population greatly increased during the Great Upheaval of 1755 to 1763 when several thousand Acadians fled to the island when forced out of Nova Scotia by British governor Charles Lawrence. The British occupied the island in 1758, dispersing more than 3,500 of the settlers. Great Britain obtained the island from France under the terms of the Treaty of Paris in 1763, which settled the Seven Years' War, calling the colony "St. John's Island" or "Island of St. John's." Prince Edward Island map 1765. The first British governor of St. John's Island, Walter Patterson, was appointed in 1769. He assumed office in 1770, and had a controversial career during which the initial attempts to populate and develop the island under a feudal system were slowed by land title disputes and factional conflict. In an attempt to attract settlers from Ireland, in one of his first acts Patterson led the island's colonial assembly to re-name the island "New Ireland," however the British Government promptly vetoed this as exceeding the authority vested in the colonial government; only the Privy Council in London could change the name of a colony. In 1772, Captain John MacDonald settled on the Island, bringing with him 210 Highland Scots, mostly from the Hebridean Isle of Uist. The move was religiously inspired as Hebridean Catholics were under pressure from the Presbyterian Church to convert. During and after the American Revolutionary War from 1776–1783, the colony's efforts to attract exiled Loyalist refugees from the rebellious American colonies met with some success. Walter Patterson's brother, John Patterson, one of the original grantees of land on the island, was a temporarily-exiled Loyalist and led efforts to persuade others to come to the island. The 1787 dismissal of Governor Patterson and his recall to London, in 1789, dampened his brother's efforts, leading John to focus on his interests in the United States. Edmund Fanning, also a Loyalist exiled by the Revolution, took over as the second governor, serving until about 1806. 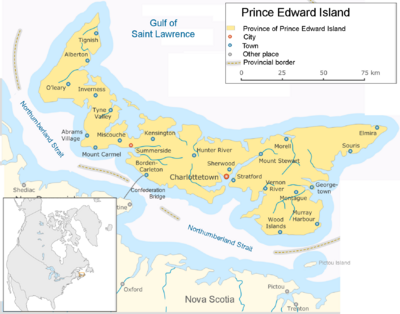 On November 29, 1798, during Fanning's administration, Great Britain granted approval to change the colony's name from St. John's Island to Prince Edward Island to distinguish it from similar names in the Atlantic, such as the cities of Saint John, New Brunswick, and St. John's, Newfoundland. The colony's new name honored the fourth son of King George III, Prince Edward Augustus, the Duke of Kent (1767–1820), who was in charge of all British military forces on the continent as Commander-in-Chief, North America and was headquartered in City of Halifax. During the nineteenth century, the colony of Prince Edward Island became a popular retreat for British nobility. The coast of Prince Edward Island around Cavendish. In September 1864, Prince Edward Island hosted the Charlottetown Conference, which was the first meeting in the process leading to the Articles of Confederation and the creation of Dominion of Canada in 1867. Prince Edward Island did not find the terms of union favorable and balked at joining in 1867, choosing to remain a colony of the United Kingdom. In 1871, the colony began construction of a railway and, frustrated by Great Britain's Colonial Office, began negotiations with the United States. In 1873, Prime Minister Sir John A. Macdonald, anxious to thwart American expansionism and facing the distraction of the Pacific Scandal, negotiated for Prince Edward Island to join Canada. The Federal Government of Canada assumed the colony's extensive railway debts and agreed to finance a buy-out of the last of the colony's absentee landlords to free the island of leasehold tenure and from any new migrants entering the island. Prince Edward Island entered the Confederation on July 1, 1873. While Prince Edward Island did not join Canada until six years after its founding, it became known as the "Cradle of Confederation" or "Birthplace of Confederation," for having hosted the Charlottetown Conference. The island has a number of buildings, a ferry vessel, and the Confederation Bridge using the term "confederation" in many ways. The most prominent building in the province with this name is the Confederation Centre of the Arts, presented as a gift to Prince Edward Islanders by the 10 provincial governments and the Federal Government upon the centenary of the Charlottetown Conference, where it stands in Charlottetown as a national monument to the "Fathers of Confederation." 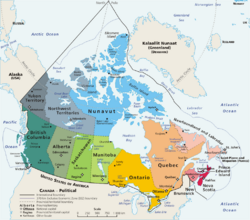 The politics of Prince Edward Island are centered on a provincial government resembling that of the other Canadian provinces. The capital of the province is Charlottetown, where reside the premier, provincial legislature, lieutenant-governor and cabinet. Prince Edward Island's government is based on the Westminster model, with a unicameral legislature—the Legislative Assembly of Prince Edward Island—consisting of 27 Members of the Legislative Assembly (MLAs), elected from 27 roughly equal electoral districts using plurality voting. The legislature may sit for a maximum of five years, as is customary in the Westminster system, and may be dissolved at any time by the lieutenant-governor, normally on the advice of the premier. By custom, the provincial Cabinet is drawn exclusively from the Legislative Assembly, and must secure the support of a majority of the Assembly's members. Under the Canadian Constitution, Prince Edward Island is entitled to four seats in the Canadian Senate, and a corresponding minimum of four seats in the Canadian House of Commons. This results in PEI being considerably overrepresented in the current House, as seven of Canada's ten provinces are to varying degrees. Prince Edward Island is the first province in Canada to have elected a female Premier (Catherine Callbeck) in 1993; both Lieutenant Governor Marion Reid and Leader of the Official Opposition Patricia Mella at that time were also women. British Columbia had had a woman as Premier prior to Callbeck (Rita Johnston), although she did not win a provincial election. The provincial economy is dominated by the seasonal industries of agriculture, tourism, and the fishery. Many of the province's coastal communities rely upon shellfish harvesting, particularly lobster fishing as well as oyster fishing and mussel farming. The province is limited in terms of heavy industry and manufacturing. Although commercial deposits of minerals have not been found, exploration for natural gas beneath the eastern end of the province has resulted in the discovery of an undisclosed quantity of gas. Agriculture remains the dominant industry in the provincial economy, as it has since colonial times. During the twentieth century, potatoes replaced mixed farming as the leading cash crop, accounting for one-third of provincial farm income. The province currently accounts for a third of Canada's total potato production, producing approximately 1.3 billion kilograms annually. The province is a major producer of seed potatoes, exporting to more than twenty countries around the world. Prince Edward Island has Canada's highest provincial retail sales tax rate, at 10 percent in 2008. The tax is applied to nearly all goods and services except some clothing, food, and home heating fuel. Approximately fifteen percent of all electricity consumed on the island is generated from renewable energy (largely wind turbines); the provincial government has set renewable energy targets as high as 30-50 percent for electricity consumed by 2015. Until wind generation, the province relied entirely on electricity imports on a submarine cable from New Brunswick. A thermal oil-fired generating station in Charlottetown is also available. The Confederation Bridge between PEI and New Brunswick. Prince Edward Island's transportation network has traditionally revolved around its seaports of Charlottetown, Summerside, Borden, Georgetown, and Souris—all linked to its railway system, and airports (Charlottetown and Summerside) for communication with mainland North America. The railway system was abandoned by CN in 1989, in favor of an agreement with the federal government to improve major highways. Until 1997, the province was linked by two passenger-vehicle ferry services to the mainland: one, provided by Marine Atlantic, operated year-round between Borden and Cape Tormentine, New Brunswick; the other, provided by Northumberland Ferries Limited, operates seasonally between Wood Islands and Caribou, Nova Scotia. A third ferry service provided by CTMA operates seasonally between Souris and Cap-aux-Meules, Quebec, and connects with Quebec's Magdalen Islands. On June 1, 1997, the Confederation Bridge opened, connecting Borden-Carleton to Cape Jourimain, New Brunswick. The longest bridge over ice-covered waters in the world, it replaced the Marine Atlantic ferry service. Since then, the Confederation Bridge's assured transportation link to the mainland has positively altered the province's tourism and agricultural and fisheries export economies. Sandstone cliffs at North Cape enshrouded in fog. Prince Edward Island is home to one university, the University of Prince Edward Island (UPEI), located in Charlottetown. The university was created by the Island legislature to replace Prince of Wales College and St. Dunstan's University, which still has its charter. UPEI is also home to the Atlantic Veterinary College, which offers the region's only veterinary medicine program. Holland College is the provincial community college, with campuses across the province, including specialized facilities such as the Atlantic Police Academy, Marine Training Centre, and the Culinary Institute of Canada. The College of Piping and Celtic Performing Arts of Canada, located in Summerside, specializes in the instruction of bagpipe and other traditional Scottish and Irish performance art such as highland dance. According to the 2001 Canadian Census, the largest ethnic group on the Island consists of people of Scottish descent (38.0 percent), followed by English (28.7 percent), Irish (27.9 percent), French (21.3 percent), German (4.0 percent), and Dutch (3.1 percent) descent. Almost half of all respondents also identified their ethnicity as "Canadian." Ninety-four percent of the population has English as their mother-tongue, with the four percent speaking French and a variety of other languages spoken in small percentages. Over 47 percent of the population practices Roman Catholicism, while 20 percent belong to the United Church, 6.5 percent have "no religion," 6.9 percent are Presbyterian and 4.9 percent are Anglican. The remaining approximate 5 percent is broken down into various practices of less than one percent each. The island's cultural traditions of art, music, and creative writing are all supported through the public education system. There is an annual arts festival, the Charlottetown Festival, hosted each year at the Confederation Centre of the Arts. The musical play Anne of Green Gables has run every year at the festival for more than four decades. An unofficial sequel, Anne & Gilbert, premiered in the Playhouse in Victoria-by-the-Sea in 2005. Prince Edward Island's documented music history begins in the nineteenth century with religious music, some written by local pump and block maker, and organ-importer, Watson Duchemin. Several big bands including the Sons of Temperance Band and the Charlottetown Brass Band, were active. Acadian, Celtic and rock music prevail, with exponents including Timothy Chaisson, Lennie Gallant and Two Hours Traffic. The celebrated singer-songwriter Stompin' Tom Connors spent his formative years in Skinners Pond. Robert Harris was a well-known artist. The banks of the Hunter River in New Glasgow. ↑ Population and dwelling counts, for Canada, provinces and territories, 2011 and 2006 censuses. Statistics Canada (February 8, 2012). Retrieved February 8, 2012. ↑ Gross domestic product, expenditure-based, by province and territory. Statistics Canada (November 8, 2011). Retrieved June 19, 2012. ↑ Martin Mittelstaedt, Pesticides are what is killing our kids, The Globe and Mail. Retrieved July 11, 2008. ↑ Brendan O'Grady, Exiles and Islanders: The Irish Settlers of Prince Edward Island. p. 15. ↑ John Sutton, PEI History, Prince Edward Island Online. Retrieved July 15, 2008. ↑ The Confederation Bridge, About the Bridge. Retrieved July 11, 2008. Arsenault, Georges. 1989. The Island Acadians, 1720-1980. Charlottetown: Ragweed Press. ISBN 9780920304815. Baglole, Harry. 1977. Exploring Island History: A Guide to the Historical Resources of Prince Edward Island. Belfast, P.E.I. : Ragweed Press. ISBN 092030401X. Beck, E. Boyde, and P. John Burden. 1996. Prince Edward Island: An (Un)authorized History. Charlottetown, P.E.I. : Acorn Press. ISBN 9780969860617. Bolger, Francis W. P. 1973. Canada's Smallest Province: A History of P.E.I. Charlottetown: Prince Edward Island 1973 Centennial Commission. Bumsted, J.M. 1987. Land, Settlement, and Politics on Eighteenth-Century Prince Edward Island. Kingston [Ont. ]: McGill-Queen's University Press. ISBN 9780773505667. Clark, Andrew Hill. 1959. Three Centuries and the Island; a Historical Geography of Settlement and Agriculture in Prince Edward Island, Canada. Toronto: University of Toronto Press. Ives, Edward D. 1999. Drive Dull Care Away: Folksongs from Prince Edward Island. Charlottetown, P.E.I. : Institute of Island Studies. ISBN 9780919013346. Livingston, Walter Ross. 1931. Responsible Government in Prince Edward Island, a Triumph of Self-Government Under the Crown. Iowa City: The University. MacKinnon, Frank. 1995. Church Politics and Education in Canada: The P.E.I. Experience. Calgary, Alta: Detselig Enterprises. ISBN 9781550591040. MacKinnon, Wayne E. 1973. The Life of the Party: A History of the Liberal Party in Prince Edwards Island. Sharpe, Errol. 1976. A People's History of Prince Edward Island. Toronto: Steel Rail Pub. ISBN 0887910033. Smitheram, Verner, David Milne, and Satadal Dasgupta. 1982. The Garden Transformed: Prince Edward Island, 1945-1980. Charlottetown: Ragweed Press. ISBN 9780920304105. Weale, David, and Harry Baglole. 1973. The Island and Confederation: The End of an Era. History of "Prince Edward Island"
This page was last modified on 1 June 2015, at 23:18.